Valentine's day is my FAVORITE holiday to decorate for. I love the colors and for some reason I'm partial to hearts. 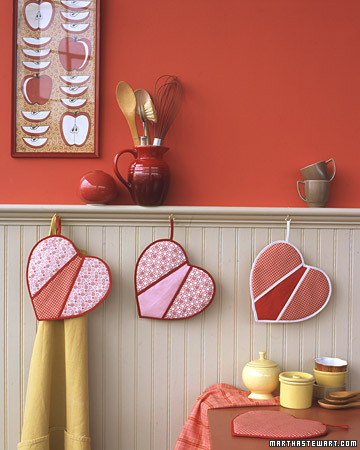 How adorable are these Valentine pot holders from Martha Stewart? With her template and easy instructions, found here, you could hammer out a few of these in an hour EASILY! I think I'm going to go get some fabric tomorrow to make a few of these! I might just be tempted to use them all year long!